This year’s Deepavali was somehow fun despite the northeast monsoon rain rocked the Chennai, as well the entire state. I think the rain is very important, which let us survive throughout the year rather the one day celebration Deepavali! 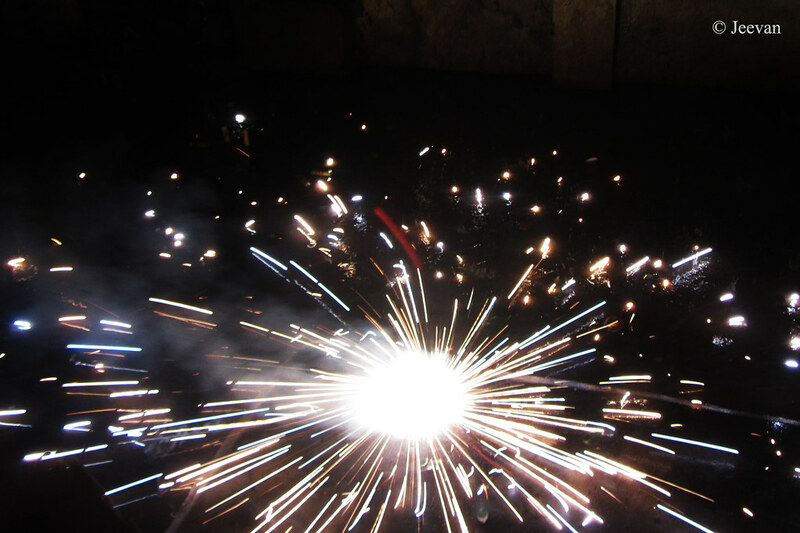 Fireworks can be ignited on any other day or skip to Karthigai Deepam, if rain permits, but when drought stroke the heart of the state – Chennai – the real celebration was receiving rain. Though everyone was happy about the rainfall, thanks to deep depression in Bay of Bengal, the storm that landfall near Cuddalore suffered a lot on the day ahead to Deepavali and still fighting to come out of the flooded water. The Chennai experience showering throughout the day, though not heaver, the festival of light was burnt and bound little for the day. I bought some fireworks for Deepavali through online shopping. Glad the leading firework manufactures open there own site for purchasing, with a demonstration video on each firework on how it displays. I was certain not to get any crackers that make noise, as I myself could not withstand the loudness these days; I went for the fancy fireworks that make colorful the night sky (though it make noise up into the sky, the effect perhaps is less and unavoidable) aside sparkles, ground chakra and flower pots. Every year I used to go out into the neighborhood (on the day and ahead to Deepavali) to catch up the festival mood and looking out into the sky for fireworks displayed by the area people, but this time I couldn’t make up such moves, as rain continue to shower uncertainly when will it stop and begin. I stayed indoors all the day and to and fro to Deepavali, watching the pretty bore programs on TV and looking at the rain whether it stop for an hour to light fireworks. By afternoon the rain decides to hold sometime, and thus I went to my uncle’s house in the adjacent street and had some fun joining/watching my cousin and his friends playing with crackers. 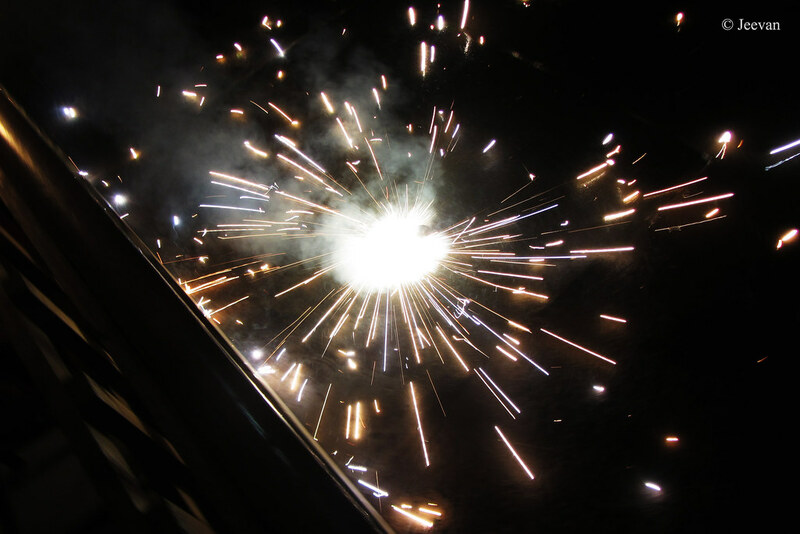 Though I hated the noise come from the crackers, I enjoyed the moment being there and it remind me the days I celebrated Deepavali with those crackers (Lakshmi, Sparrow, Red bijli cracker...) and daring to hold it in hand and throw away once ignite. I managed to stay there sometime and chatting with them but the time came in droplets of rain rushed me to home before it started to pour. In the evening my cousin and his friend come to home to help me leaving the aerial fireworks and I really enjoyed our own display of fireworks. As I was feeling uneasy that evening, I couldn’t capture photos on the display of fireworks, so got couple of photos on ground chakra that we let last night. Lovely shots. And how wonderful to hear that you also got rain! Yes, rain is very important, I agree. It would have been very nice to have it wit one more day to rain...but rain is needed! i'm glad the rain held off for a while so you could enjoy some fireworks and firecrackers. Fireworks are so fun and if everyone is careful it is a good thing. I am glad the rain stopped for a while. PS: I didn't burst crackers this year too. My country has multi racials with many festive seasons for various races. So you can hear lots of booming loud fire crackers and fireworks! That is added fun for everyone.